The project ”Rural Development: Effective Land Management“ – funded by the EU and the German Government – is designed to support rural development through an effective management of agricultural land in Serbia. It contributes to the development and implementation of legal regulations concerning agricultural land and strengthens administrative structures and capacities within the respective institutions. The project also facilitates the implementation of land consolidation schemes in seven pilot municipalities as well as it develops measures to reduce abandoned agricultural land. The project has the purpose to improve the framework conditions for effective management of agricultural land in the Republic of Serbia. Various challenges have to be considered in view of the framework conditions for managing agricultural land. Legal regulations and administrative procedures are outdated and do not consider good practice examples from other countries, such as member states of the EU. Approaches and tools for monitoring land ownership and land use are not effective and do not generate the necessary data for managing agricultural land. Of particular importance is the consolidation of agricultural land and combating the abandonment of agricultural land. For both there are currently no legal regulations and administrative procedures in place. The Legal and administrative framework is improved according to EU best practice. Improved management and monitoring procedures for state-owned agricultural land are in place on national and municipal level. Schemes for consolidation of agricultural land are implemented. Schemes for combating abandonment of agricultural land are implemented. The four results taken together contribute towards the project purpose: Framework conditions for effective management of agricultural land are improved. The project supports the capacity development of all involved institutions on national and local level. On the national level the project’s work focuses on legal regulations, administrative framework, management and monitoring approaches. Furthermore, the organizational structure and service procedures are subject to advice by the project in order to improve their efficiency. On the local level, municipalities and authorities are supported in implementing the beforehand jointly developed approaches, procedures and tools. Therefore, besides organizational support, another key aspect is the provision of methodological and technical skills for applying new procedures and tools effectively. All procedures, approaches and tools will are developed jointly with all relevant stakeholders from the national and the local level. Peer-to-Peer learning approaches have been applied throughout the project, in order to strengthen the capacities of the Serbian Ministry of Agriculture and Environmental Protection (MAEP), in particular its Directorate for Agricultural Lands (DAL), responsible for agricultural land management. Also close ties with the Serbian Republic Cadastral Authority (RGA) have been established. Various formats have been applied during the course of the project, some of which are presented on exemplary basis in this application example, which focus on the component of improving procedures for land consolidation. At the time being, Serbia has received candidate status to become a member of the European Union. In order to achieve compliance to existing EU legal standards, it has an interest to adapt required EU laws. However, the transition process is not easy to manage, as Serbia has to reform its legislation, which is mainly inherited from former Yugoslavian times. Therefore, a pronounced interest in complying with EU regulations was given and exchange of knowledge was required on both national and local level. While the government was not capable to fully fund peer-to-peer learning exercises, the projects setup was designed to initiate and contribute financially to organize peer-to-peer learning exercises. Therefore, exchange of experiences and travelling in the region was affordable. 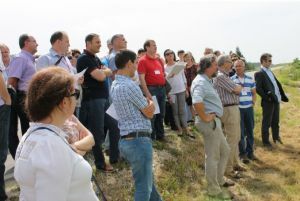 The project was designed in order to improve agricultural land management in Serbia, therefore the project design included the allocation of sufficient resources for delegation visits, study tours, seminars, conferences and other formats. In the long term, the ministry needs to increase its own funding to sustain its learning processes. In former land consolidation projects, decisions were enforced on land owners, and planning decisions were made in a top-down approach with lack of transparency and participation. This led to a strong discontent of the land owners. In the northern region of Vojvodina, which is largely consolidated by now, entire areas have been cleared from bush, shrub and trees which led to imbalanced, degraded ecosystems. There, cultivation of crops requires a use of large amounts of pesticides, herbicides and fertiliser, which has a negative impact on the quality of the produce as well as on the ground water and environment. Environmental assessments were not carried out to prevent from this damage. The Southeast of Serbia, where the pilot land consolidation projects are implemented, is still rich in biodiversity. An application of former standards in this areas would highly endanger the ecological balance. Land consolidation projects in Serbia were and still are mainly used for reallotment in areas with a high land fragmentation. Land consolidation was only perceived as a tool for improving agricultural productivity by merging and reallocation of parcels. Staff from DAL and RGA on national level as well as staff from municipalities needed to be involved into the discussion, how land consolidation needs to be modernized in Serbia. There was a pronounced demand to be exposed to EU regulations and good practices in land consolidation on both hierarchical levels on national and local level. organise a land conference jointly with FAO with participants from 26 countries in order to present and discuss current approaches. Additional inputs were given to DAL in order connect them to organizations and networks on the policy level, by providing additional support through the GIZ sector project land management, that funded DAL’s attendance at the World Bank conference on land policy and poverty. Neighboring countries of Serbia in eastern Europe provide a multitude of experiences in the EU accession process. Representatives from authorities involved in land management from Slovenia, Macedonia, Montenegro, Bosnia/Herzegovina and Hungary were invited for roundtable discussions, in order to openly discuss the process of EU accession and its legal requirements. Furthermore, many of those countries share a similar former socialist Yugoslavian history, with similar structural changes required. The law formerly applied in Serbia has been adopted from the German model. 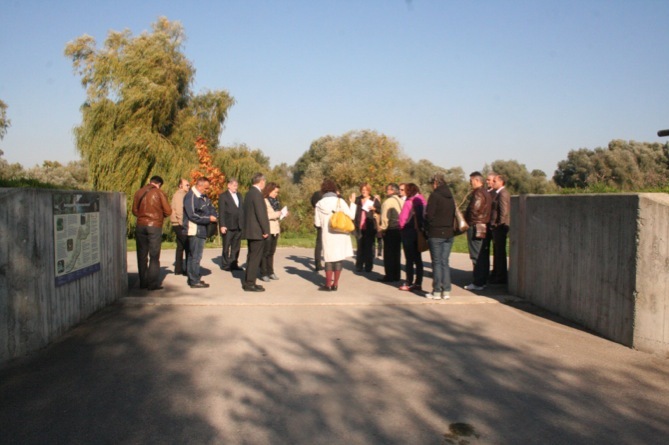 Because of that, the first study tour to Germany was chosen, in order to gain insights how land consolidation is organized and implemented in the three German federal states of North Rhine-Westphalia, Baden-Wurttemberg and Bavaria. Additional study tours were conducted to Lithuania and Portugal. 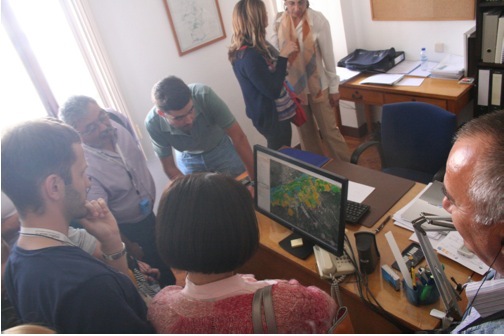 During the course of the project, the opportunity came up to organise a LANDNET conference jointly with FAO Hungary. It was a great opportunity to expose Serbian experts in Serbia with an international group of experts from state organizations and academia. Along with this conference, a field excursion was organized in order to show the progress of land consolidation in one pilot municipality. The round table discussions were opening up the floor to EU member states and those in accession to present the opportunities and challenges that come along for land management and agriculture on the way to EU accession. This improved the awareness within staff ftom the Serbian Ministry (MAEP), about what are the important legislative requirements to comply with EU regulations. The study tour on land consolidation in Gemany was conducted for one week in September/October 2013. 17 government and project staff were traveling through germany, visiting three federal ministries implementing land consolidation projects. The tour did not only comprise the visits to the particular ministries, but also to see the implementation of the projects on site. 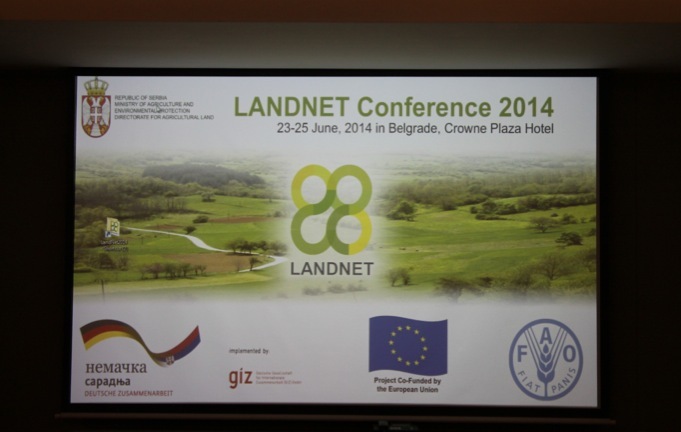 DAL, with the support of the project, the GIZ sector project on land policy and FAO Hungary as co-organiser, hosted the LANDNET 2014 conference in Belgrade in June 2014. LANDNET is a network of experts that meet annually to exchange experiences, research information and knowledge about land management issues in Eastern Europe. More than 100 participants from 28 countries were invited. The conference was finalised with a field excursion of a pilot municipality of the project, where land consolidation is ongoing. Germany has invested largely into setting up capacities for land consolidation, and provides substantial funding for implementation of land consolidation projects. In Germany, land consolidation projects are always linked to rural development and village renewal measures. Land Consolidation projects in Germany require about 5-15 years. Land Consolidation is undertaken in a transparent way. Public hearings and participation ensures the satisfaction of the vast majority of land owners and participants. Land consolidation projects are used not only for reallotment of parcels also as a means for a compulsory land acquisition, e.g. flood prevention or road infrastucture development. This helps the government to avoid spending too much resources due to land speculation or to expropriate. Regulations and administrative set-ups for land consolidation vary from one federal state to another. EU standards implemented as shown in Germany need to be implemented within the Serbian context (e.g. environmental assessments, landscape development planning, water and soil protection). Having visited three federal states of Germany as a showcase for modern land consolidation, the perspective was shifted from the study tour at the LANDNET conference. 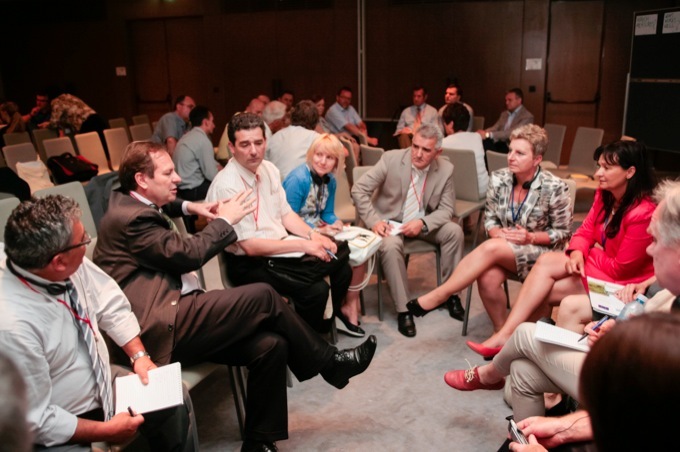 Besides LANDNET participants, the director of the office for rural development under the bavarian ministry of Nutrition, Agriculture and Forestry was invited to the conference and continued the dialogue on modern land consolidation in Serbia. In particular, discussions on the insufficient capacities (lack of staff, lack of know-how) in Serbia and requirements for an improved legal framework and were thoroughly discussed during the conference. Introducing new procedures of land consolidation into the agricultural land management in Serbia is a medium to long term process. With the results and lessons learnt and new bylaws gained from the project pilots implementing land consolidation in seven pilot municipalities, administrative stuctures and capacities need to be changed as well. Staff from DAL, RGA and the municipalities need to keep connected to networks of expertise, in order to sustain this process. Since DAL was hosting the LANDNET 2014 conference in Serbia, staff members became member of the LANDNET network of experts, and will attend the next conference. In addition, the DAL director was able to attend the World Bank conference on land and poverty in 2014, will attend again to present his findings in 2015, therefore continuity in this learning process is ensured. Continuous media campaigns and provision of brochures and flyers also propagate the modern approaches within Serbia.